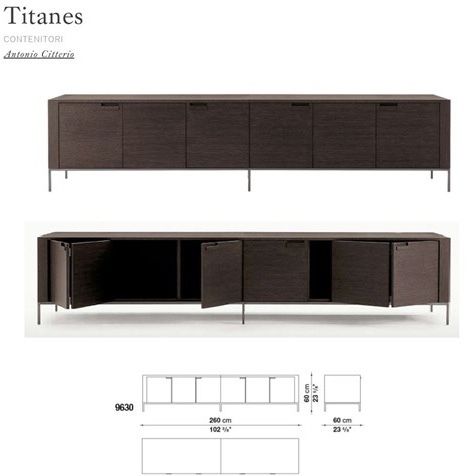 Titanes low sideboard cabinet from Maxalto is an Antonio Citterio contemporary design classic not to be missed. Designed / launched by whom/when: The Titanes Collection for B&BItalia brand Maxalto by Antonio Citterio, was released in 1996. Inspiration: Titanes is a collection of storage elements that reinterpret the traditional ‘sideboard’. Instantly recognisable by it’s unique signature handle detail. Fabrication: solid wood and veneered panels in brushed smoked oak finish on square profile chrome steel frame. Bi-fold doors and removable internal mid shelf. Hidden Features: Separates into 2 pieces for lift and stair access. Design Consigned Stylist: Display and store your favourite design objects on this low cabinet in living, dining, bedroom or transitioning spaces. The low profile works well in front of full height windows or below your favourite artworks. Design Consigned Collector: Still in production due to proven popularity. Stamp or Mark of authenticity: Verified B&BItalia. Expect to pay over $17,000 for a new one. DC Insider: This cabinet is 10 years old but fully functioning with no marks or detracting damage. The top is faultless. We have a Maxalto Apta rectangular dining table to match. Please enquire via email info@designconsigned.com.au.